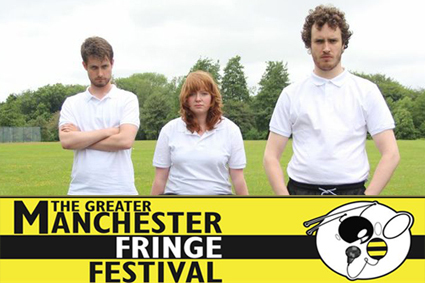 Sketch trio Gein’s Family Giftshop have regular performances at the Lass O’Gowrie and their usual slot kicked off this year’s Greater Manchester Fringe. Some combination of good fortitude and promotion saw the room above the Lass absolutely packed – but it seemed that too much focus was accorded on packing people into the room at the expense of actually, you know, showing the material. Long breaks and virtual head counts to ensure everyone was back made for a disappointingly disjointed evening. The stand-up circuit style should have suited the material as the nameless compere was good and quick, even if she was upstaged by a remarkably laconic member of the audience that she picked on. But the presentation of the whole event felt a bit sloppy, a mangled start time and confusion over whether the show was free or not didn’t exactly get things off to a good start. First act Jayne Edwards kicked off proceedings with a slightly shaky (and very short) set that raised a few titters. Her climatic doggy-dancing, minus the dog, was bound to raise some laughs. All male sketch group Staple/Face were second on letting loose their coiled-up energy in a sequence of equally amusing and bizarre sketches. An unwelcome visitor in a car proving an early highlight but a sketch involving the force feeding of cream from a Kerplunk game will either be the funniest thing you’ve seen all year, or just too strange for words. Unfortunately, definitely the latter for me. It is partially redeemed by the psychotic bedtime story that kills off most of your childhood favourites. Headliners Gein’s Family Giftshop have been likened to Big Train, Jam and the League of Gentlemen, and I can see why. Their mix of madcap comedy sketches involving fractured families, kidnapping and some literal monkeying around finally provide some much needed laughs. It’s not perfect, but the trio work very well together and are self-aware enough to paper over any cracks by acknowledging them to the audience. A particular highlight was a misunderstanding over the requirement for a doctor on flight. Physically funny, it encapsulated the strengths of Gein’s Family Giftshop. I would have like to seen more of their experimental comedy as there were some genuinely surreal moments mixed in. Ultimately though the overall show is a mixed bag, it certainly needs to be slicker and more polished. They’re obviously popular, and there are some moments to enjoy in here though I’d much rather have seen more comedy and less breaks. It must be said though that each act alone might be better than this disparate sum of its whole. A shame. Gein’s Family Giftshop are at The Laughing Horse @ The Blind Poet in Edinburgh from 1-25 August. More details here.